Taquitos Jalisco has three locations in Central Florida. I visited the one in Winter Garden. They claim to have the "best homemade Mexican food" and use all fresh ingredients. Drinks include soft drinks, house wine, beer, Latin sodas, etc. Meals ranged from $6 - $11 each. Click here for their locations and menu. My dinner companion and I had been driving around for about 30 minutes (probably more), trying to decide what to eat for dinner. Neither of us had anything specific in mind or were very hungry, so we just kept driving... and driving... and driving. We actually found ourselves in Winter Garden (we were trying to make it to Yellow Dog Eats before it closed - no luck) and we found ourselves at Taquitos Jalisco. From the outside, it looked pretty packed (good sign) and open (an even better sign, since it was getting late). We decided to give it a try. I have to say that I am glad that we found this restaurant because I probably never would have tried it since I have Mexican restaurants that I like in my immediate area. (I rarely head over to West Orlando.) Although we were late comers, the service was excellent. We were sat immediately, given menus, and drink orders were taken. Fresh salsa and homemade corn chips were served. The salsa had fresh cilantro in it and was very tasty. It was a bit runny for my taste (I happen to like my salsas very hearty), but still delicious. The bottled hot sauce at the table was called Tapatio Salsa Picante. I did not try it but my dinner companion said that it was flavorful with a kick. I decided to try a combo platter that had a quesadilla, beef taco, and chicken burrito, as well as beans and rice. I added chorizo to the quesadilla. I took one bite of my quesadilla, turned to my companion, and said, "If you want a bite of this, get it now," because I knew that it would be gone soon... it was right up my alley - cheesy meaty! I was glad that I had added the chorizo because it gave the quesadilla a little bit of a kick and it mixed perfectly with the ooey gooey cheese. The beef taco was surprisingly spicy. After deconstructing the taco a bit, I realized that it was actually the beef that it made spicy. I am a little bit of a spice wimp so I couldn't quite eat the taco by itself, I had to mix it with the beans to cool it off a bit (my dinner companion - who CAN handle spice - said that the beef was a little spicy too). The chicken burrito and beans were also tasty (not spicy and no need for salt), although the beans were a little runny in texture for me. My dinner companion had the chilaquiles, which were layers of tortilla chips, green sauce (chile verde), and cheese and added beans, rice, and chicken. This dish was also tasty. I liked how the chips made the texture of the dish crunchy. Live entertainment was a xylophone player, which was really fun. There were two large groups there and one birthday celebration. The xylophone player played "Happy Birthday" to the birthday boy and the whole restaurant sang to him. The servers seemed comfortable with the two large groups and everyone seemed pleased with the service. One good thing about eating at Taquitos Jaliscos was that we passed the El Salvadoran Pupusas food truck on the way home, so we stopped and got a couple for the ride home! My companion ate his when we got home and I had mine for breakfast the next morning. Pupasas are thick tortillas with cheese melted inside, along with another filling. The El Salvarodan Pupusas food truck offers both meat and veggie options, and we ordered one of each. The meat was chicken and jalapeno. The veggies included spinach and mushrooms, along with garlic. Both were tasty, even after being heated up, and were served with a vinegar based cole slaw. 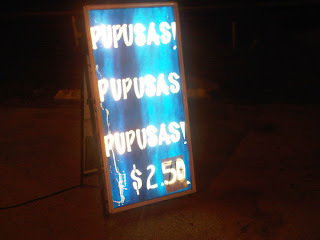 The pupusas are $2.75 - $3 each. I tried the "Pupusas" truck yesterday at the Fashion Sq Truck Bazar -- first time, ordered the pupusas with jalapeno cheese very good! It came with a side of pickled cabbage and hot sauce, very tasty and inexpensive. Taquitos Jalisco is one of my faves. My Clermont-living, Orlando-schooled ex took me there back when we were in high school. He raved about it and it actually was great food and friendly people. I think they even catered his grad party. It was just awesome to me that even though he went to a Winter Park HS, a shopping center restaurant was still his favorite. This just proves don't judge a book by it's cover. This place is amazing.